Gary Vincent Radle, 64, of Dodgeville passed away on July 14, 2018 at Sunnyside Group Home. Gary was born in Lacrosse, WI on May 3, 1954. He received his graduation certificate from Putnam Heights in Eau Claire, WI. Gary worked in sheltered workshop for Career Development Center for a number of years before he was hired at Kwik Trip in Altoona. He started each day with a hug and a smile, and genuinely knew the meaning of unconditional love. He was an avid Packer fan; going to the Battle of the Bays with his brother Tim was one of the highlights of his life. Gary had a love for music, fishing, bowling, and horseback riding. He frequently attended Brewers games with Tim. 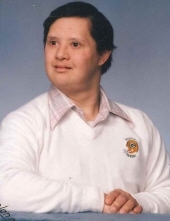 He was a member of the Special Olympics and attended Party Rec in Eau Claire. Gary is survived by his foster mother Janet Franks; brothers Mike (Lisa) Button of Branson, MO, Tim (Tamie) Franks of Marshfield, WI, Tom Franks of Tomahawk, WI, Jerry Hoesly of San Antonio, TX. ; Sisters Lori (Brian) Houle of Reseda, CA, and Lisa (John) Dougherty of Green Bay, WI. ; Aunt Joyce Udelhoven; Uncle Ken Hoesly; Nieces and Nephews, Alyssa and JT Franks, Courtney, Tanner and Josh Button, Emily Sue, Sadie, and Sam Dougherty, Samantha, Casey, Brady and Sean Houle, Dustin Hoesly; as well as many other friends and relatives. Gary is preceded in death by his Father Glen Cunningham; Mother Gladys Cunningham; foster father Charles Franks and Sister Sara Cunningham. Gary’s family wishes to thank Crystal, Natalie and staff at Sunnyside East for showing such compassion and love to Gary during his time at the group home. You are all very much appreciated. The funeral service will be held at 11:00 AM on July 28, 2018 at Stokes, Prock and Mundt Funeral Chapel 535 S. Hillcrest Pkwy. Visitation will begin at 9:00 AM on the day of the service at Stokes, Prock and Mundt. Burial will follow the funeral at Calvary Catholic Cemetery in Eau Claire. The family requests that Green Bay Packer attire be worn to the service. "Email Address" would like to share the life celebration of Gary Victor Radle. Click on the "link" to go to share a favorite memory or leave a condolence message for the family.